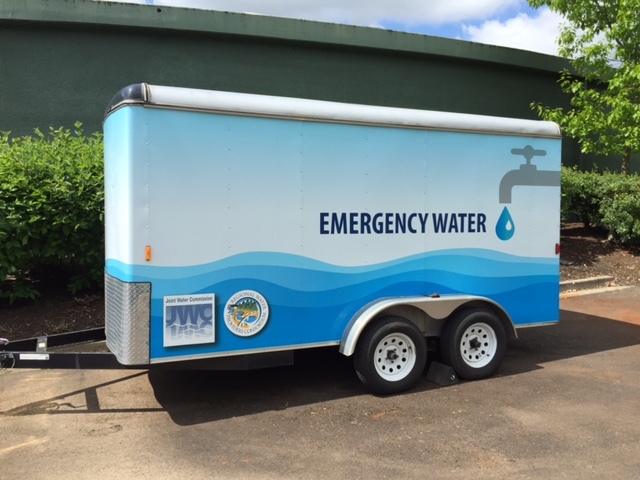 The Joint Water Commission (JWC) is actively preparing for every kind of emergency- large and small- to ensure an appropriate, effective and timely response to any situation that potentially compromises potable (drinking) water supplies. The distribution of safe drinking water could be detrimentally affected by several types of emergencies including earthquakes, floods, and explosions. Each of these could cause damage of varying degrees to system infrastructure, such as the water treatment plant, water pipeline or dam. Emergencies could also be caused by water contamination – either accidental or intentional. The purpose of JWC’s emergency planning is to maintain a safe water supply and minimize inconvenience to you during an emergency. To ensure that we successfully respond to an emergency we have described specific emergency response actions for all kinds of emergencies in a comprehensive Emergency Response Plan. In addition, this plan identifies a ‘Chain of Command’ making certain each staff member understands their responsibilities and accountability. The JWC also has emergency cooperative agreements with other agencies identifying their ability to assist us during an emergency. The Emergency Response Plan is never considered “finished” and is reviewed and updated regularly by emergency program staff. In addition to maintaining a comprehensive Emergency Response Plan, JWC staff participates in annual training exercises. These trainings provide JWC staff with an opportunity to work together under stressful conditions, practice roles and responsibilities, detect deficiencies in the Emergency Response Plan, and identify unforeseen needs for successful emergency response. The JWC has also purchased a portable water system for emergency distribution of drinking water. The system can be hooked to a working hydrant, meter, or other water service, and operators can use the system hoses to fill sanitized plastic bags with up to three gallons of drinking water. Operators have participated in several regional exercises and have practiced setting up the distribution system at identified distribution points. They also practiced filling bags and distributing them to role-playing citizens in distress. The points of distribution are set up to serve customers as quickly and efficiently as possible, and to ensure that all customers receive water that is safe to drink. For more information on the JWC’s Emergency Response Planning, call 503-615-6702 or send an email.